Nearly 4 months ago Southern France began to report on an unprecedented outbreak involving 5 new strains of avian influenza, likely the product of both reassortment and the mutation of LPAI viruses to HPAI. These outbreaks involved new strains of HPAI H5N1, H5N2, and H5N9, along with LPAI H5N2 and H5N3. All are reported to be of European lineage, and unrelated to the more dangerous Eurasian H5N1 virus. Although the outbreaks appear to be winding down, since the last Defra Update (Feb 19th), three more HPAI outbreaks have been reported, with the most recent today. In total, to date, 75 of highly pathogenic avian influenza outbreaks in poultry were detected in 8 departments of the Southwest of France. ANSES delivered its opinion delivered on 14 December 2015, on the potential dangers to humans from avian influenza strain identified, including the results of total sequencing of H5N1 detected in the first home in the Dordogne. She confirmed the absence of this dangerous H5N1 strain of the key markers for humans. 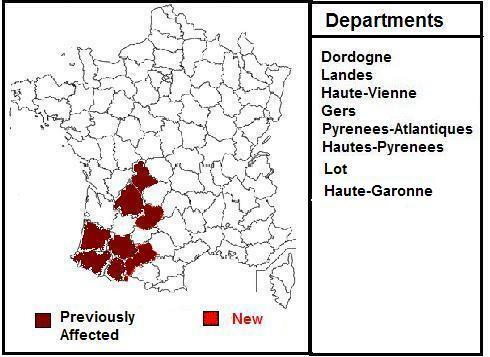 A new case of highly pathogenic avian influenza was reported March 10, 2016 on a farm of breeding ducks in the Landes department. The set of management measures is being implemented currently. An OIE Report filed yesterday indicates this outbreak has been identified as HPAI H5N9.